Just for clarification – our criteria is #4, slept at least one night in the state in the RV. That’s not just a missed sticker – so far we haven’t been to California in the RV. In the beginning, we went north to visit Jere’s sister in Washington, and then we started toward Florida. We didn’t really WANT to go to California for a number of reasons (traffic being high on the list). After plenty of experience driving in all sorts of conditions, including big-city rush hour, we finially decided Californiat would be okay to visit. We were going to go there to visit family this summer, but plans changed and now we are heading east to New York. So, at some point when we are back on the west coast, all our California-based family (both his and mine) will get visits and we’ll put the sticker on the map. 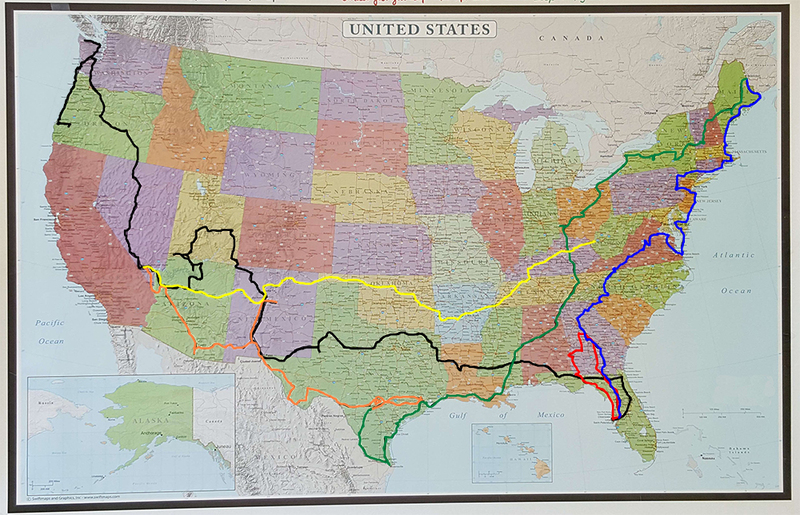 When we head west to Oregon and Washington this fall, we will plan to hit another “row” of states. They’ll have to be the more southern ones (Indiana, Illinois, Missouri, Kansas, Colorado, Wyoming and Idaho). Hopefully, we’ll beat any of the really bad weather (or will be able to hunker down safely somewhere if we’re visited by any major storms). Travel route segments, August 2015 to June 2017. BLACK – Starting in Oregon August 11, 2015, we arrived in Clearwater, Florida just before Christmas. RED – After a couple of months in Clearwater, we did a small loop through Georgia for a couple of months before the HSCG Conference in May. BLUE – After the conference, we went as far north in Maine as we could (and still get good cell reception!). GREEN – From Maine we worked our way to Texas, where we spent Christmas 2106 in San Antonio. ORANGE – Starting the New Year (2017) we headed toward Las Vegas for the HSCG Conference in May. YELLOW – After the Conference, we started east, on our way to New York, and are currently in West Virginia. All told, one pretty complete lap around the US, and we’re on the second one. 18,000 miles. Wow. 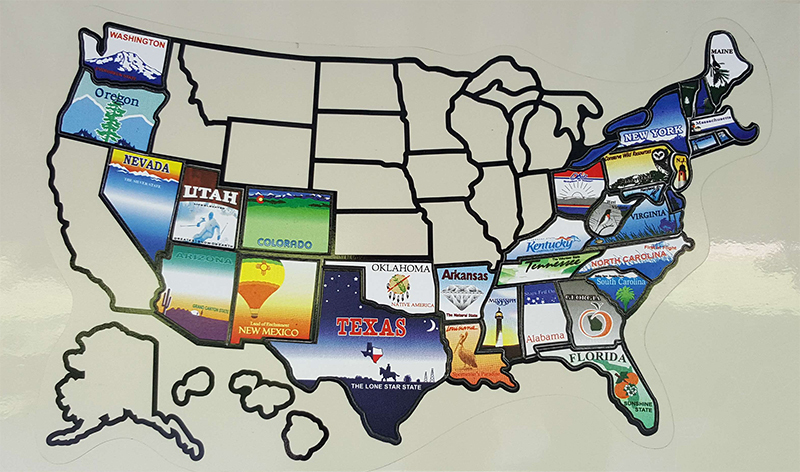 We ha e traveled many states with all four of the RVs that we have owned. I need to put up a map and do the same thing, color coding in the future. My husband would love the idea too! And it looks cool, too! I’m thinking that when/if we ever settle down into a house, I’ll have the map framed to hang on the wall.